Could robots be the writers of the future? Will automated drones be writing the novels of 2100? It might be concerned with aliens, outer space and dimensional jumping for now, but 'sci-fi' might have to be redefined if the latest advances in automated writing continue apace. Software that can construct sentences, analyse data and even put a 'spin' on a news story are threatening to make the newsdesk and the author's writing room very different places. Journalism isn't complicated. The popularity of online news stories can be tracked – and therefore the importance of news easily ranked – while almost everything is written using the inverted pyramid structure. Since automated writing software can already do most of that, are we looking at the last generation of human journalists? Narrative Science's Quill is the leading automated writing software title. It transforms structured data into readable, plain English stories that are identical to those written by humans, though at far greater speeds. "Quill's power lies in the fact that it is a synthesis of data analytics, artificial intelligence and editorial expertise," says Kris Hammond, Chief Technology Operator at Narrative Science. Quill has artificial intelligence in the form of a natural language engine, as well as an ability to describe, predict, and advise based purely on data. "From a data perspective, the system incorporates state of the art analytics to extract insight, describe situations, predict outcomes, and generate prescriptions based on the core data and the goals of the vertical in which we are working," says Hammond. "From an artificial intelligence perspective, the system uses the results of these analytics to drive a heuristically based inference engine and the central natural language generation." Quill's success hinges on its ability to reproduce journalistic 'angles' on a story – the 'spin' – and it's that part which is protected by patents. The rest is just algorithmic analysis of the type that all software uses. Obviously it can't conduct interviews with politicians, celebrities and football managers, but give it data and Quill can reproduce a bona fide news story in seconds. Some see other weaknesses in humans that automated writing software overcomes. "Some journalists don't understand what they are writing about and occasionally get the story wrong, or have an irrational bias one way or the other," says Peter Cochrane, former CTO of BT and now an independent technology analyst based in Suffolk. I can't fundamentally disagree with that statement without displaying bias, though the concept of a machine being able to review consumer electronics products, apps and software, for instance, from a human user perspective – the only perspective that's relevant – is a concept that doesn't make any sense. TechRadar is safe, and investigative journalism is surely beyond the reach of robots, too. Avatars that interview? Perhaps – and there's no denying that machines do have advantages when compared to humans. 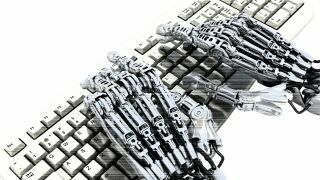 "They never sleep, never miss important information or the latest facts, and they deliver better results than humans," continues Cochrane, insisting that automated writing software has already taken over in the financial industry. "The only limit on the technology is that Quill can only generate language where there is data to begin with," says Hammond. "While this could, in theory, include textbooks and novels, it is doubtful we will see the technology applied to those problems in the near term. It does, however already send out Tweets during sporting events." That sounds like a bit of a time-saver for the sports desk. Hang on, could automated software be the journalist's best friend? It writes news stories and the financial section, leaving human journalists to do the interviews and attend the boozy press functions. If automated software is a time-saver, bring it on. "No one should be worried about automated writing systems," says Hammond. "As with our technology they are designed for writing into spaces where no one else is writing, and working in coordination with other writers and analysts.